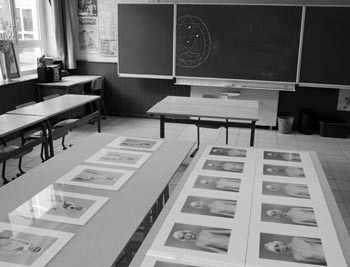 A show going on in Antwerpen, curated by Bert Danckaert: SPEELTIJD (Playtime) is a collective exhibition organized in a high school, in the context of the classrooms, the corridors, the stages… Dirk Braeckman’s photograph is above the photocopy machine, surrounded of paper stock… Rineke Dijkstra’s portrait on a white board, my Water-polo and butchers are flat on tables. Some paintings of Karin Hanssen really work like an installation in the context. Out the work of each artist, the main research in my point of view is the amazing work by Bert Danckaert, his reflection about the environment in a very poetic way. The installations of our creations by Bert become his own artistic research and reach the best score: a A or a 20/20.